We have some macros for ImageJ/FIJI for making figures and blind analysis which could be useful to others. I made an ImageJ Update Site so that the latest versions can be pushed out to the people in the lab, but this also gives the opportunity to share our code with the world. Feel free to add the quantixed ImageJ update site to your ImageJ or FIJI installation. Details of how to do that are here. The code is maintained in this GitHub repo, which has a walkthrough for figure-making in the README. 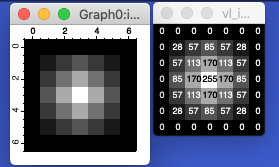 So, if you’d like to make figures the quantixed way, adding ROIs and zooms, then feel free to give this code a try. Please raise any issues there or get in touch some other way. Disclaimer: this code is under development. I offer no guarantees to its usefulness. I am not responsible for data loss or injury that may result from its use! Update @ 10:35 2016-12-20 I should point out that other projects already exist to make figures (MagicMontage, FigureJ, ScientiFig). These projects are fine but they didn’t do what I wanted, so I made my own. An occasional series in esoteric programming issues. As part of a larger analysis project I needed to implement a short program to determine the closest distance of two line segments in 3D space. This will be used to sort out which segments to compare… like I say, part of a bigger project. The best method to do this is to find the closest distance one segment is to the other when the other one is represented as an infinite line. You can then check if that point is beyond the segment if it is you use the limits of the segment to calculate the distance. There’s a discussion on stackoverflow here. The solutions point to one in C++ and one in MATLAB. The C++ version is easiest to port to Igor due to the similarity of languages, but the explanation of the MATLAB code was more approachable. So I ported that to Igor to figure out how it works. //what about the point on PQ is this also outside the segment? MatrixLLS wouldn’t accept a mix of single-precision and double-precision waves, so this needed to be factored into the code. As you can see, the Igor code is much longer. Overall, I think MATLAB handles Matrix Math better than Igor. It is certainly easier to write. I suspect that there are a series of Igor operations that can do what I am trying to do here, but this was an exercise in direct porting. More work is needed to condense this down and also deal with every possible case. Then it needs to be incorporated into the bigger program. SIMPLE! Anyway, hope this helps somebody. The post title is taken from the band Adventures In Stereo.